Medical researchers are constantly looking for ways to administer treatments to suffering patients in less painful and inconvenient ways. 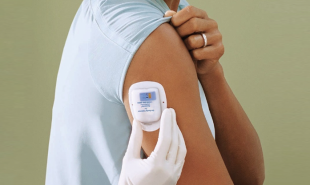 We recently wrote about the temporary tattoo which could provide a non-invasive alternative to diabetics’ daily blood tests. 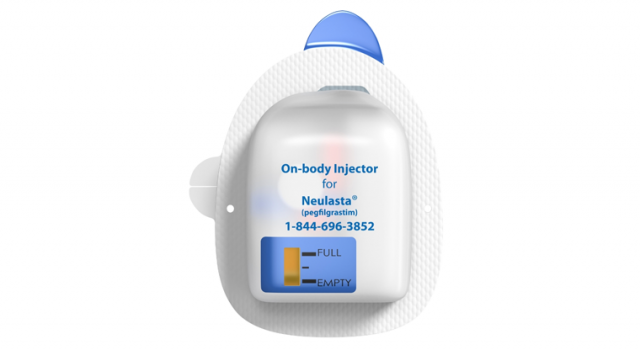 The Neulasta Delivery Kit is another such device which could improve treatment conditions — it is an on-body injector that can help ward off some of the side effects of chemotherapy by delivering pegfilgrastim to patients the day after their treatment starts. One of the most common side effects of chemo treatments is neurtropenia — or low white blood cell count. Neulasta can help boost white blood cells if delivered exactly 27 hours after chemotherapy begins, but despite having been available for 12 years, often patients don’t receive their prescribed dosage because their treatment has made them unable to return to hospital for the injection. The Neulasta Delivery Kit solves this problem by enabling patients to receive the treatment from the comfort of their own home. After the chemotherapy session, clinicians can fill and activate the syringe with the correct dosage. They then apply the on-body injector to the patient and it automatically activates the following day, providing the patient with the medicine they need without requiring them to return to hospital for the shot. Are there other follow up treatments which could be administered in this way?